“Mere light is too common a thing to make a strong impression on the mind, and without a strong impression nothing can be sublime. But such a light as that of the sun, immediately exerted on the eye, as it overpowers the sense, is a very great idea… But darkness is more productive of the sublime ideas than light… [However,] Extreme light, by overcoming organs of sight, obliterates all objects, so as in its effect exactly to resemble darkness… Thus two ideas as opposite as can be imagined [are] reconciled in the extremes of both; and both in spite of their opposite nature [are] brought to concur in producing the sublime… The passion caused by the great and sublime in nature, when those causes operate most powerfully, is Astonishment; and astonishment is that state of the soul, in which all motions are suspended, with some degree of horror…” (Burke, qtd. 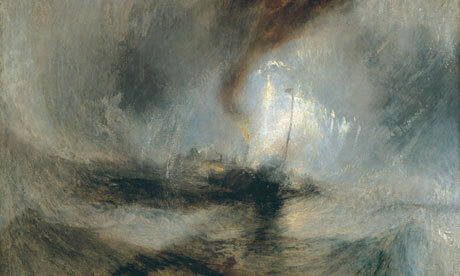 in “JMW Turner and the Sublime,” Turner Museum website). 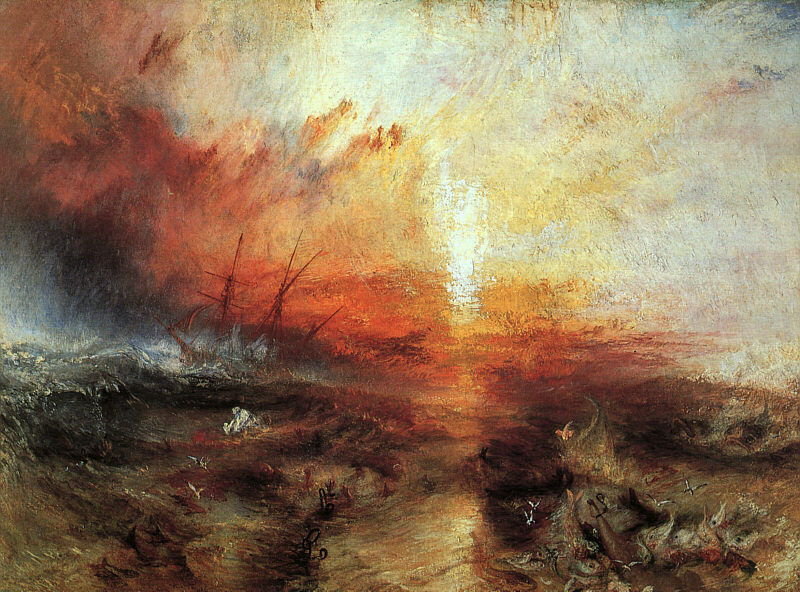 Thus, Turner sought to convey these most extreme passions — astonishment and horror — through the swirls of light and darkness cast about in storms on land and sea, nearly obliterating the shapes of common objects in the process. While he’s painted fairly concrete pieces, I prefer his more abstract, impressionistic work; the chaotic power of his style is (to me) more profound without the anchor of easily distinguishable figures. The following are some of my favorites. For more information on JMW Turner and his work, check out The Turner Museum website. It’s not the light that counts… but the shadows… With pure light, or pure darkness, we see nothing; light is invisible. To be a great artist or great writer we need to be a shadow maker.